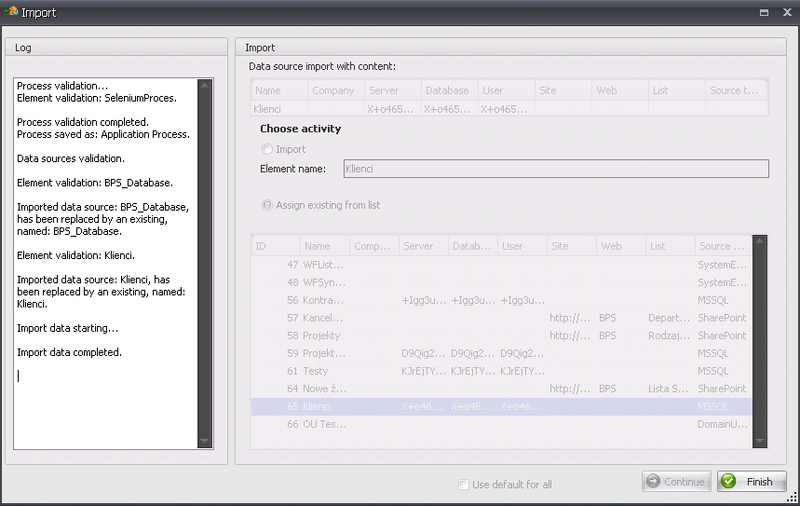 WEBCON BPS Designer Studio allows you to import and export created processes. These mechanisms make it easy to share the processes in multiple environments. The import/export functionality is available from the Studio toolbar or from the process context menu (export only). Below you can find a simple explanation for both process export and import. When selecting process to export, you only need to specify the location of the record. Processes are exported in the .zip format. Do not change file extension of an exported process – it needs to be .zip for further imports to succeed. The default name of an exported process has the following format: “ProcessName_ID_YYYY-MM-DD HH-MM-SS“. Of course it is possible to change it while selecting a location for exported process. The task of importing a process is intuitive and largely automatic. Process is imported with all settings it was configured with as well as with data sources needed for it to work correctly. Before actual import starts process and is being evaluated – data import starts only after evaluation is successful (which usually is if it was exported correctly from Designer Studio). Designer Studio cache restarts during an import of a process. IMPORTANT: Version of the database from which the selected process was exported should match the current database version. If it turns out that the imported process was created in a Designer Studio that was using an older version of the database, a message will be displayed (for example after Studio update). After you click “Import process” (or click “OK” as in the above example), an import widow like the one below will open. If the imported process is related to a data source, the source will also be imported or an already existing source will be assigned to the process (user chooses from a data source list) if it corresponds to it. When the imported process uses SharePoint groups that do not exist in the target environment, a message will appear giving you the following options : leave group ID without changes, remove them from all occurrences in the process and stop the import of the process. On the left side of ​​the window there are process import logs that contain relevant information about import progress or failure(if there is any).